Whenever I start a duty period it always seems to use my domicile's time zone regardless of where I'm starting and I can't seem to find a setting to change it! I have "Use my domicile as my theater" in the airline settings section off. Anybody know how to get the time zone for your report time to change? What airline are you working for that you have a different report location than your domicile? We are not aware of this. Please check SETTINGS..GENERAL and reference the Display Times In. My airline is Air Wisconsin. I think the issue comes from that I am trying to add trips manually instead of importing. I finally figured out how to import using the copy/paste method, however as far as I can tell I can only do this method on a computer (because I am a reserve pilot and thus my trips don't show in FLICA). When I receive a reroute or schedule change without access to a computer I have to add everything manually and it seems to default to a report time zone of Central time (even though I have my settings-general-display times in set to local). I have found a work-around though, if I put in the legs that include my actual starting location then click on duty again it will update to the proper time zone. Is there a way to import a trip directly from my IPad instead of needing to use a computer? All import methods require access to the internet to parse the trip data. If you do have it available, there are three ways to import... APDL Toolkit, Paste & Process inside of APDL, APDL.net. I’m not familiar with FLICA, but from your description I assume you need the desktop version of your trip in order to copy and paste. If an option in FLICA, switch to the desktop view. Otherwise.. 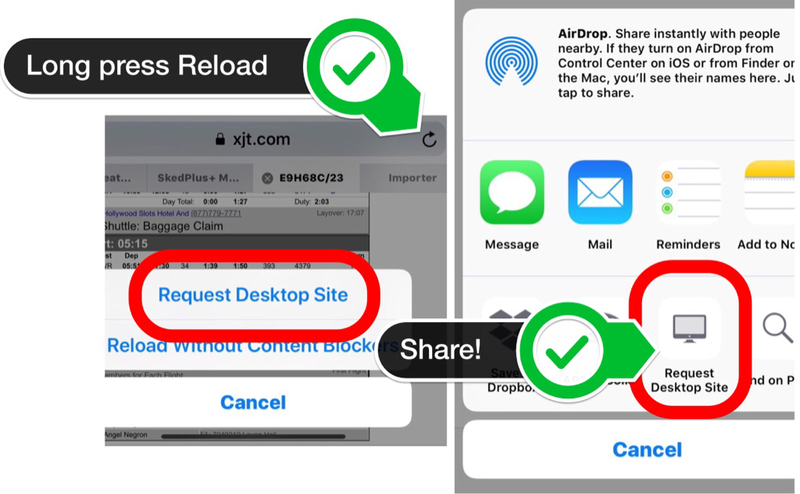 Within iOS there are two ways to request the desktop version of a webpage, if available. While viewing the page, tap the Share button, and along the bottom scroll to “Request Desktop Site”. If for some reason that option is not available, long press the Refresh icon and a “Request Desktop Site” option pop up should be available. Once you have the desktop version of the trip data, the quickest way to import is to use the Toolkit. 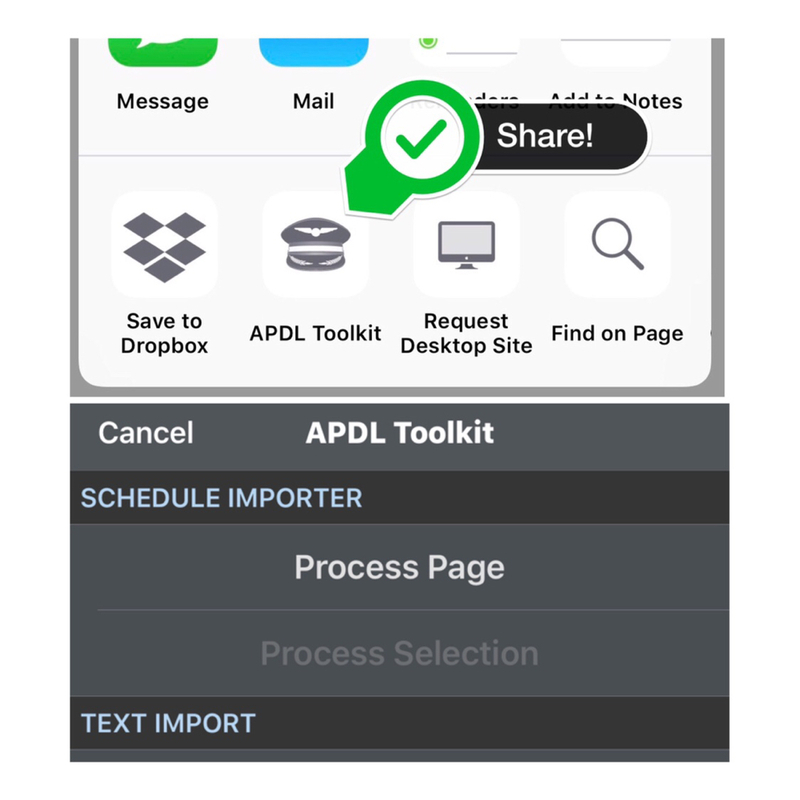 Tap the Share button, and along the bottom scroll to “APDL Toolkit” and on the following page, select the Process Page option. Alternatively, with the desktop version of the page available, you can select the trip data and within APDL select Import Trip...Paste & Process. Lastly , with the trip data you can select APDL.net and import from there. One of these processes should mimic your normal workflow to process the trip.